This location has it all! ESTABLISHED business with a SMALL-TOWN FEEL in high traffic area of Los Angeles! 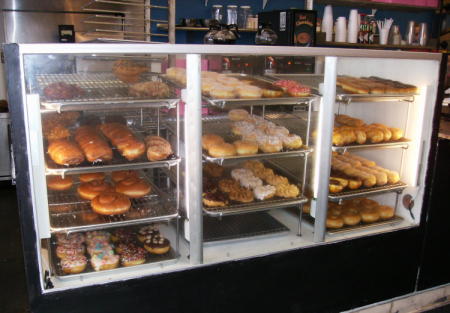 Located on a busy street in Hollywood, this charming Donut Shop and Bakery has stood the test of time with OVER 25 YEARS of operation behind it!!! Location is near the theater district, recording studios, and film studios which brings in regular business. There is a 750-unit apartment complex under construction on the adjacent corner, making this the perfect time to get in on this investment! Continue the success of the current customer base and see a potential jump in sales upon the opening of the urban housing complex. There is a quick-serve national brand market and a laundry mat on either side that bring in customers throughout the day. Little things like handwritten notes on the takeout bags add a small-town touch that is greatly appreciated by both new and returning customers in a large city like Hollywood. Sellers Profit and Loss statements show a $50,000+ profit expectation for 2018. Major sales increases have been reported since the new owner has added new menu items and contracted with secondary delivery services. They have opened on several occasions from 9PM to 5AM doing delivery ONLY and have had sales of up to $600 during these traditionally slower times. This could be increased to 7 days a week if there was staff to accommodate this. These numbers are backed by sales tax returns. SellingRestaurants has not verified the numbers. MENU: Besides fabulous Donuts there is also fresh-baked croissants, muffins, loaf breads and an array of drinks from fresh brewed coffee, hot chocolate, cold brew coffee, smoothies, and shakes. There are Breakfast sandwich and Lunch sandwich selections. Between the exceptional food quality and the detail-oriented customer service, this location has been given a 4 1/2 Star review on YELP. Seller has found the drive from the far west side of San Fernando Valley to be too much daily and is taking time away from family. She has decided to sell and let someone else take advantage of the tremendous opportunity here. There is currently no website for the location. Adding a website and order feature for catering orders could see an even bigger growth potential. This is a rare opportunity to strike while the iron is hot by taking advantage of an already flourishing business at the beginning of another wave of ongoing success. The right person can carry on its legacy and prepare for the opportunity to see a great return on their investment.